From stealthy movements to deciphering secrets, spy games for kids make any child feel like a mysterious secret agent or detective. Whether you're looking for new games to try at home or planning a secret agent birthday party, these games will keep the kids occupied on missions all day. If you're hosting a spy party for a holiday, carnival, or birthday, group games that incorporate detective and secret agent skills are easy to create. Look for games that involve cracking codes, sneaking around, or solving a mystery to keep kids engaged. How many scoops of ice cream did the target eat? What gift did the target bring? Did the target sing "Happy Birthday?" How many games did the target participate in? Spies need to be able to blend in with their surroundings and hide. This simple obstacle course uses body outlines in different shapes to help child spies hide in plain sight. To start, you'll need some painter's tape for this indoor obstacle course. To make this an outdoor obstacle course, make the outlines on large pieces of cardboard you can stand against trees or lay on the ground. Choose the route for your course, like around the living room. 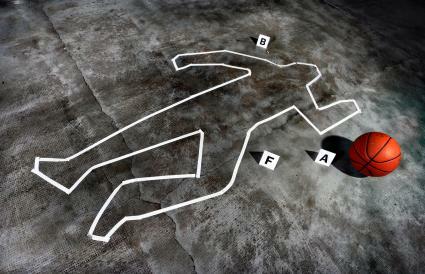 Walk the route and create a tape outline of a body in a specific pose every five feet or so. Poses might be standing on one leg, two arms raised high overhead or a squatting position and it helps to use your child in those poses as the model you tape around. Make footprint outlines leading from each body outline to the next. As each child runs the obstacle course, they have to correctly stand or lay against each pose in order and step only in the footprint outlines. Confirm each pose for the child and time them then see who completed the course in the fastest time. Tournaments are easy competitions to set up for groups of any size. You'll need to create a tournament bracket on a piece of poster board to start. Choose 3 to 5 different types of puzzles that will challenge the child detective's skills in figuring out how to solve clues quickly. Types of puzzles include actual puzzles with pieces you fit together, word puzzles, rebus puzzles, and funny riddles. For the first puzzle you choose, you'll need one for each player. Pair players up randomly, give them their puzzles, and the first person to complete their puzzle from each pair moves to the next round. In the second round, you'll have half as many players and will still need one puzzle per person. For each round in the tournament choose a different type of puzzle. Whenever possible use the exact same puzzle for each player so the skill involved is the same. The last person standing is the winner. Spy school kids activities are fun as part of your lesson plans in the classroom or learning opportunities at home. If you're looking for an icebreaker game for the first day of school for 8 to 10-year-olds or are teaching an economics lesson about wants versus needs, this game is for you. All you need are writing utensils and printable shopping checklists for each student. The game works best in groups of 5 or more. Each kid thinks about a few things they currently want and need from a big box store like Walmart and adds them to the appropriate columns on their checklist. Once all lists are handed in, number each one and hang them on the wall. All students must then write in their own secret notebook who they think is responsible for writing each list and what clues gave them away. At the end have everyone write their name on their list and discuss the results. When detectives and spies collect clues about who committed a crime, they often look for DNA. Since each person's DNA is unique, it easily identifies who left it behind. To start this STEM spy game each child will need to make a DNA model using mini colored marshmallows, licorice ropes, and toothpicks. Each student should make a unique DNA structure then make an exact copy of it. 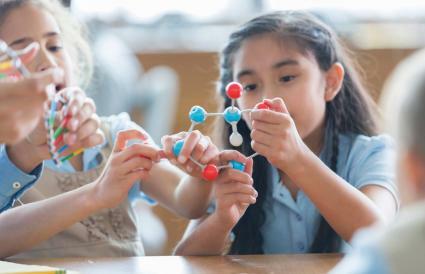 Once complete, the entire class sits with their heads down and eyes closed while one student at a time hides one of their DNA models somewhere in the classroom. Make note of one of these locations to use as the scene of the crime. Each student then gets up and leaves their other DNA model on their desk. Describe your crime using clues about the scene you noted earlier without giving its location away completely. Kids then have to search the room for the DNA that fits the described crime scene and look for which other student's DNA model on their desk is a match. When a student thinks they've solved the crime, they can sit back down and write their answer on a slip of paper. Older kids who understand what puns are can compete to count them all in fun picture books based on puns or jokes for this Language Arts activity. Choose a picture book filled with puns like 7 Ate 9 by Tara Lazar or Exclamation Mark by Amy Rosenthal and count all the puns in the book. Arm each student with a pencil and notebook. As you read the story aloud, kids can write down all the puns they hear. Try to read slowly and pause after each page so they have time to write. At the end of the book see who spotted the most puns. From logic puzzles to code-cracking worksheets, there are tons of printables you can use as spy games. Choose a printable to include in your spy or detective activities then incorporate its storyline or theme into your other activities. In the Animal Lovers' Logic Puzzle kids have to use the given clues to figure out which kid chose each unusual pet. Extend the activity by changing the names on the worksheet to the names of four kids at your party and hiding stuffed animal versions of the four pets around the room. Hand out the logic puzzle to each child. Once a child figures out who each pet belongs to, they'll have to be stealthy in finding the stuffed versions and returning them to their rightful owner before anyone else does. Use the printable Horse Code to leave secret messages for your secret agent. Send your kids on a mission to do a chore or find a prize by creating a message using the symbols from the horse code answer key. Draw the correct horseshoe symbol for each letter in your message. Cut the horse code printable into strips so each row of symbols/letters is separate and hide them around your space. Kids will need to find all the pieces of the code answer key and use them to crack the secret code and discover their spy mission. A big part of being a good spy is noticing details. Challenge your kids to complete a "spot the difference" worksheet like the printable Spot the Spooky Differences handout. Give them a magnifying glass to make the activity feel more spy-like. Add to the challenge by setting a short time limit. 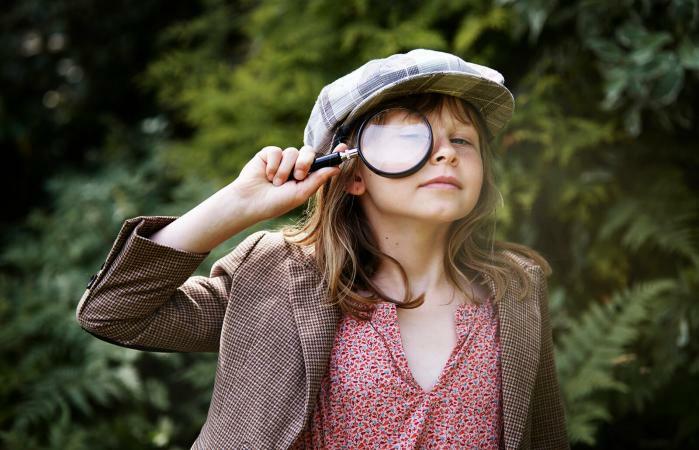 Hand a child a magnifying glass, a notebook, a pen, and any other spy gear to create a spy in the making. For some kids that's all it takes for them to bounce away in search of a mystery to solve. For others, however, you may need to help them develop their "spy skills" using detective versions of simple games they already know. I Spy - One person picks out an object in a room and states, "I spy with my little eye…" He or she then describes the object in one or two words. Other players try to guess what the object is. You can also use other senses such as "I hear with my big ear..." or "I smell with my big nose..."
What's Missing? - Players are asked to look closely around the room before leaving it. Then, one person takes one object and hides it in the room. Players return to the room and carefully observe what might have been taken. Two Truths and a Lie - This fun detective game for kids involves figuring out which of the three statements made by another kid is a lie and which two statements are true. Whether it's a rainy day or a birthday party, spy games get kids excited because they involve stealth and mystery. Give your child the chance to be a secret agent for one day by suggesting one or more spy games. They can dress up in a trench coat and carry a magnifying glass to get in character.